Michael Chiarello: Burrata Caprese with Heirloom Tomatoes, Basil Oil, and Spicy Balsamic "Caviar"
Jacques Pépin shows how to butterfly a whole chicken. 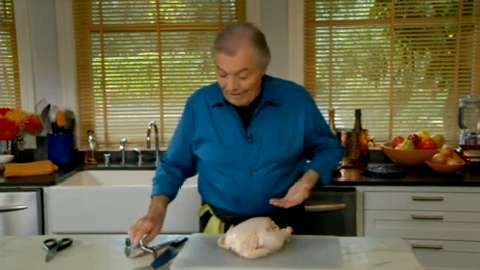 You know Grilling or boiling a chicken usually goes faster than the roasting. And this is the way I do it, usually take the end here of both the drumstick. Of Coarse you can do it with your knife like this. I fold the wings underneath, And I split it in half. It take half of the time now to roast. Now, I go, see on which side of the neck here with the point of the knife, I go through. If you feel you're not proficient enough with the knife, Now and use one of those to cut. I'm going to cut on the other side here. [BLANK_AUDIO] Okay, that's kept for stock. Now the secret of this, if there is a secret, is this. I really press it to have it. Now there is always a place where it doesn't cook completely. There it at the joint here. So what I do I do a little incision right in the joint. Same thing on the other side here in the joint. The second place where you look that is never cooked enough is between the drumstick and the thigh. Same idea here I cut I rip it in between, you won't even see it. I do the same thing for a turkey when I cook it like that so the breast is cooked and the heat of the time to go there and it's not red at the joint here. It's great to grill or to broil the chicken. This way you can brush it up with mustard, honey, ketchup Tabasco a mixture of all of those to make a beautiful hot crust and in fact a great way of doing it.